The most basic requirement of any fly reel is simply to store your fly line and an adequate amount of backing. The reel plays no part in casting and for some types of fly fishing does little help you land fish. So why, you may ask, do we stock such a wide range of reels? The answer to this is in two parts. Firstly, we offer reels designed for specialist fly fishing applications such as saltwater and secondly, there are a huge range of reels on the market manufactured to suit a wide range of budgets and preferences. Here is our guide to choosing the correct reel for you and some important things to bear in mind when making your selection. There are two main manufacturing processes used to produce fly reels and some reels rely on a combination to achieve the finished product. Die cast – This mass production process uses molten alloy poured or injected into a mould. It is generally used in less expensive reels and was a driving force in lowering the price of reels when it was introduced by Hardy’s early in the 20th century. Die casting allows manufacturers to produce forms that would be impossible to create with a machining process. The downsides to die casting are that it does not give such tight engineering tolerances and a reel dropped from height onto a hard surface may shatter. CNC machining – The majority of top end fly reels are made from computer numerical control machining of bar stock aerospace grade aluminium. Machined parts are then anodised to prevent corrosion making them resistant to saltwater. Reels manufactured in this way are lightweight, strong and will take a lot of punishment and wear. The materials and manufacturing process make reels made this way more expensive but with care and regular maintenance they should last a lifetime. What species will you be fishing for? This is the key question to ask yourself when choosing your new reel. For example, reel’s for salmon will need to offer enough capacity to hold a speycasting line and sufficient backing. 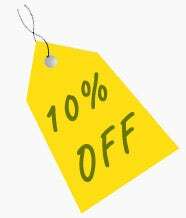 One point to bear in mind here is that manufacturers often label reel models with sizes that relate to fly lines for single-handed rods, so a reel designed for a 10wt saltwater line will not take a 9/10 or 10/11 speycasting line and backing. Reels for light river trout or grayling fishing only need a simple click & pawl check – there is no need for a sophisticated disc drag and the extra weight penalty this brings. However, reels for saltwater fishing need to be corrosion resistant and here a reliable disc drag system is an indispensable asset. What size reel is correct? As explained above, the most important thing is that the reel offers the correct capacity to hold your fly line and backing. In addition, you need to factor in balance. The loaded reel should ideally balance the rod in your hand at the point where you grip the handle. This will make the rod feel light and remove any tip heavy feel from the outfit. 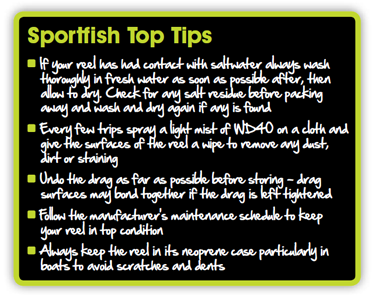 There is also your personal preference – very small reels can feel fiddly if you have large hands. Use the information panel for each reel listed for specific information on size, weight and capacity. There are several types of fly reel on the market and each has been built with a particular use in mind. The type of fishing you are looking to do will determine which reel will suit you best. 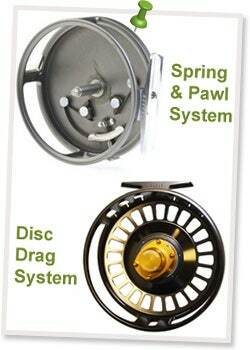 The 3 main designs of fly reel are detailed below. The arbor is the distance from the centre spindle to where the base of the spool starts. With a SA reel the spools base (the part you attach the backing to) is in the middle of the reel. This is the traditional design of reel that is still favoured by some anglers for use with smaller river rods and traditional cane fly rods. They hold plenty of backing but on the down side the frames are often very narrow. The backing and the fly line is put on to the reel in very small diameter coils which reduces your retrieval rate per revolution and puts more coil memory into your fly line. Regardless of the quality of your line they make for poor line storage - the tighter the line is coiled, the more the line will suffer from coil memory. A mid arbor is the middle ground of the 3, the base of the reel has been moved out slightly from the spindle in the middle and the reel has been widened to compensate. These reels have a good capacity for backing and keep the line in a larger loop to reduce memory and increase line retrieval rate. These have a lot more metal machined out to reduce weight. 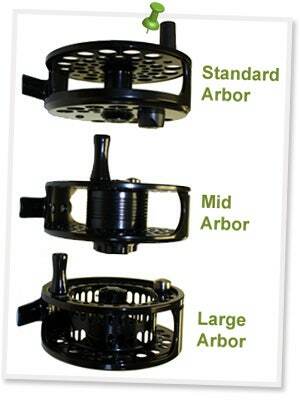 Large arbor are the most modern of reel designs, they are physically larger than the other 2 designs for the same line rating. They have a much bigger diameter and are wider in their design. This allows a good backing capacity, a very fast retrieval rate (with some reels being able to recover up to 14 inches per revolution) and subsequently a reduced line memory. For some more traditional anglers these reels just look too big for the rod but they are very light in weight and balance any size of rod perfectly. These reels are highly machined to reduce weight as much as possible without compromising structural stability. What is a cassette fly reel? This is a fly reel that uses inexpensive plastic spools. These can be easily exchanged to allow fly lines of different types and densities to be swapped over on the same reel. Most will come with a selection of spools in a purpose designed carry case and extra spools can be purchased as required. They are ideal for competition trout anglers, those on a budget and travelling anglers trying to reduce the weight of their kit. For many years a fly reel would have a solid replacement spool, you would remove the whole spool and replace it with another. Often the cost of the spool would be roughly half the cost of the reel. A modern take on spare spools has been developed (courtesy of the competition match angler who would often be carrying as many a 20 different lines and spools). For the convenience of being able to carry lots of spools the cassette or cartridge reel was developed. The way that they work is a plastic spool will locate into the spool frame which will then pop into the frame in the same way as a conventional spool would. What type of drag system? There are two main types of drag found on fly reels. Traditional standard arbor designs tend to come with a “spring and pawl” or “click drag”. This is a simple cog mechanism that alters the amount of pressure applied to the spindle. There isn’t a big different between full and minimum drag. The advantage of the S&P drag is that it weighs very little so reduces weight but has very little stopping power over large fish. This drag is ideal for small rivers or still waters. This is the most popular and modern type of drag system. This works as a brake, it increases the tension put on the reel as a fish tries to pull line off but maintains a low pressure when winding in. They work by either applying pressure to the inside of the spool (Tibor) or by having all of the braking done within a hub or housing (Nautilus). Disc drag systems are made of varying materials which include Cork, Carbon fibre, Titanium, Ceramic, Teflon and Rulon as the most popular. The best disc drag systems are able to apply as much a 20lb+ of torque. There are 2 main types of DD system: sealed, such as the Nautilus NV range which are water tight and zero maintenance and non sealed drags such as the Tibor’s which require oiling and greasing to maintain performance. These reels are designed to take a lot of abuse and be used in the harshest of conditions with the strongest of fish, a must for the saltwater angler and salmon fisherman. This is a question that can make normally calm and reasonable fly anglers get quite animated! There really isn’t a right or wrong but today the majority of right handed anglers will prefer to wind the reel with their left hand leaving the more dextrous right hand to cast and control the rod. With a double-handed rod it is less important as you will cast both sides with either hand up the rod. There are no rules – the choice is yours. Most reel’s are easily converted from LHW to RHW but it’s a good idea to have all your reels set up the same way!